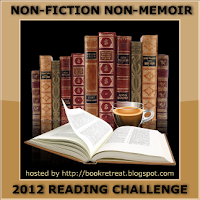 Thanks to everyone who participated in the Non-Fiction Non-Memoir Reading Challenge. I hope you enjoyed it! Link up below with your recap post, or post a comment telling me how you did with the challenge. I'll post my own recap later in the week. Everyone who linked up to the original sign up and also links up below will be entered into a giveaway of a $15 gift card to Amazon.